It that time of the year again – the festive labels are lining up in front of the wine stores to remind us that we are entering into literally a six week of non-stop celebrations – Thanksgiving, Christmas, New Year, friends, families, holiday parties. 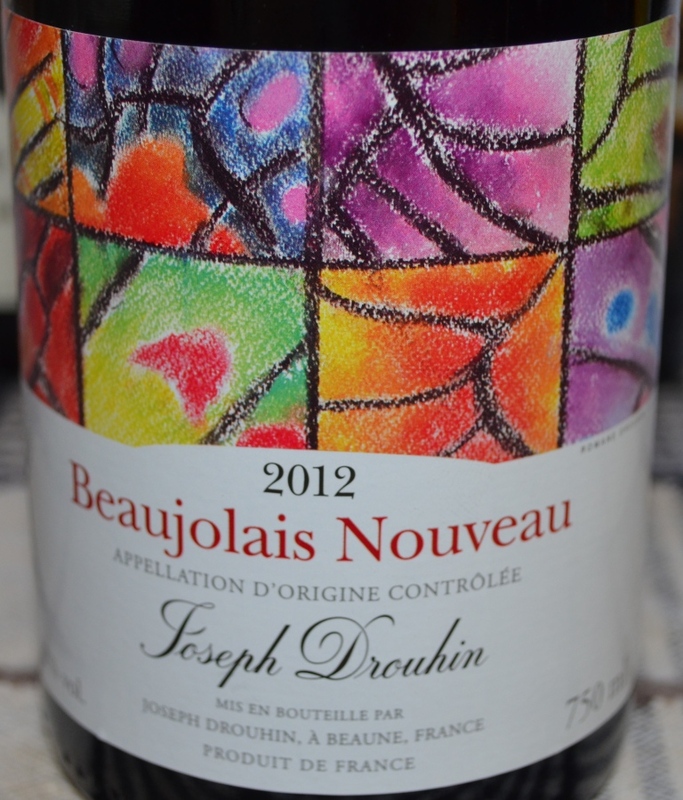 With its festive label, coming out every third Thursday in November, Beaujolais Nouveau signifies both arrival of the wines of the new harvest, and the arrival of the holidays. The tradition of celebration of the new harvest with the wines of Beaujolais is well more than hundred years old. It became linked to the third Thursday of November in 1985, and then little by little, became a huge marketing success. That huge success became the worst enemy of the wine, with the producers starting to make soulless, insipid wines, void of any substance – and Beaujolais Nouveau phenomenon almost died at the very end of 20th century, with people simply ignoring the wines as only a marketing ploy. Luckily, over the last few years, the situation started to change to the better, or I would even dare to say, to the “much better”. 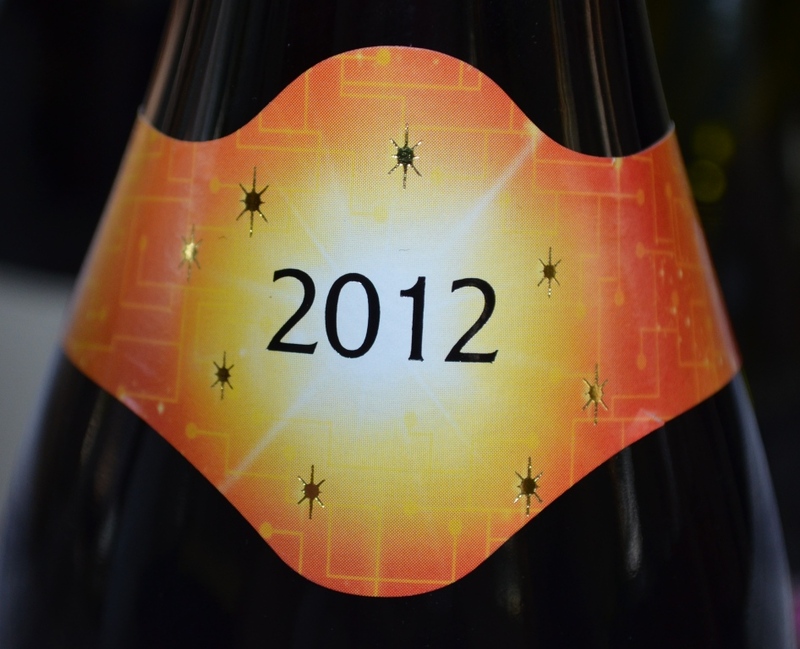 The wine behind festive labels started to show substance and character. 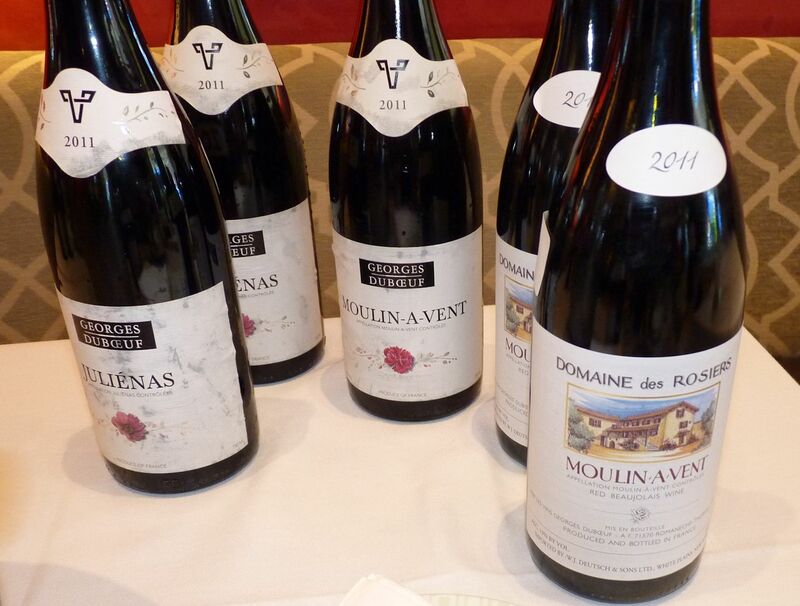 I think Beaujolais Nouveau offers a very unique opportunity for the wine lovers, as you can taste every new vintage of the same wine, and compare – something which is rather difficult to do with many other wines – and you can see how the wine is changes year over year. 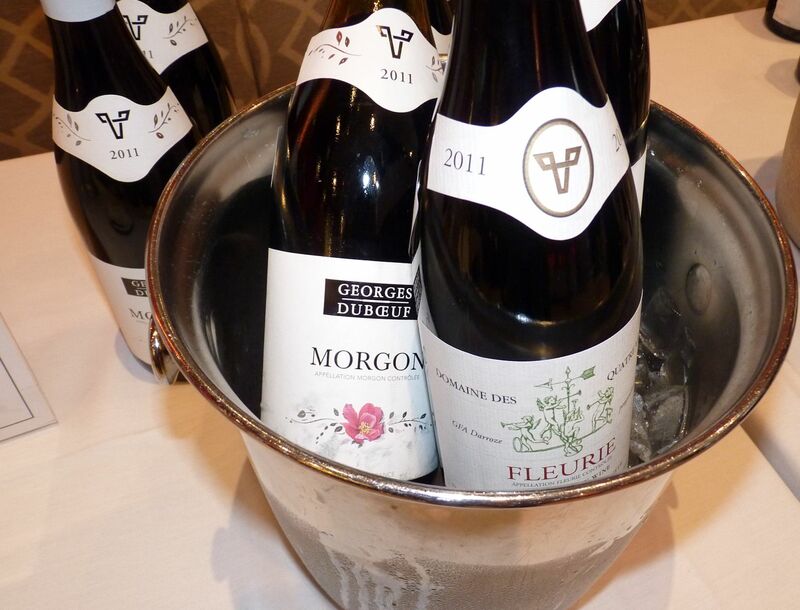 This year I had an opportunity to taste two different Beaujolais Nouveau wines – one from Georges Duboeuf, and another one from Jean Bererd & Fils, Domaine de la Madone – technically a Beaujolais Villages Nouveau, which is a different AOC designation, but for all intents and purposes it is produced in the same way as a regular Beaujolais Nouveau. When it comes to Thanksgiving, which we are about to celebrate, my choice of wine tends to be all-American – Chardonnay, Pinot Noir, Zinfandel – but nevertheless, I love opening the celebration with the glass of Beaujolais Nouveau – that clearly sets the mood to the Holidays, which have arrived. 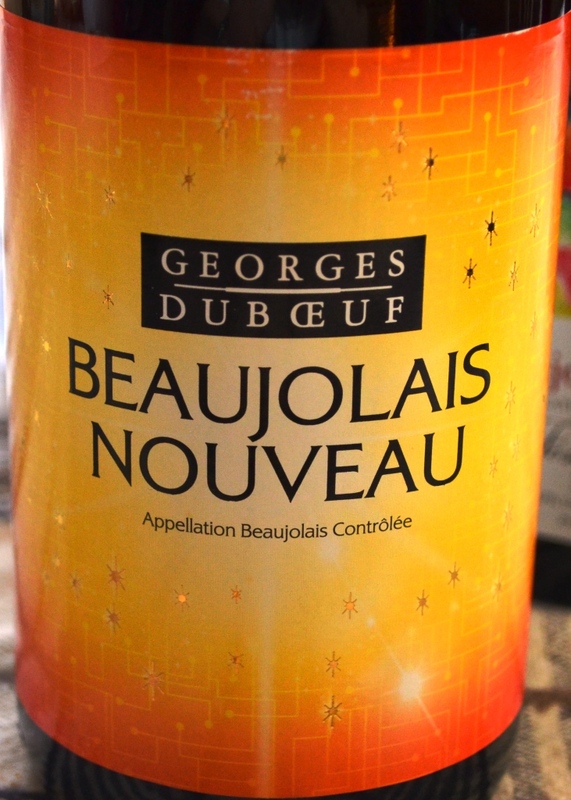 Did you happen to taste Georges Duboeuf or any other Beaujolais Nouveau wines? What do you think? Happy Holidays and Cheers! We are continuing our grape trivia series, with the focus again on the red grapes, and today’s subject is Gamay, also called Gamay Noir, and fully officially a Gamay Noir à Jus Blanc. Gamay is a purple-skinned grape, taking its name from the village of Gamay, located south of Beaune in France. Gamay is considered to be a cross between Pinot Noir and ancient white grape called Gouais Blanc. First mentions of Gamay go all the way back to the 14th century, so it had being around for a while. Gamay grapes have thin skin, and have a tendency to overproduce, creating the grapes with very high level of acidity and low sugar, which often results in the production of lightly colored and quite acidic wines. The overproduction and high acidity were the reasons for the Gamay being literally outlawed and pushed out of Burgundy by the royal rulers at the end of 14th century, to give way for much rounder Pinot Noir. As the result, Gamay mostly settled in Beaujolais area, where it became the major red grape variety. Gamay is used in Beaujolais to produce a wide range of wines, starting from the famous Beaujolais Nouveau, the wine produced within 6 weeks of the harvest – young, grape-y and quaffable, but usually not very exciting; and then going to the Cru Beaujolais ( there are 10 villages in Beaujolais, which have this status), which can be dense, concentrated and age-worthy. In addition to Beaujolais, Gamay is also growing in Loire region, where it is often blended with other local grapes such as Cabernet Franc and Cot ( Malbec) and it is used to produce both red and Rosé wines. The Rosé from Loire are typically a lot fruitier than the ones from Provence. Gamay is also successfully grown in Switzerland, especially in the area around lake Geneva – it is often blended with Pinot Noir there. 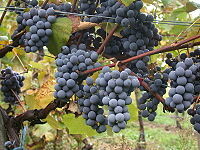 Outside of France, Gamay is planted in the number of regions, such as United States and Italy, but it doesn’t produce much of the well known wines. Interestingly enough, a world renowned wine writer and critic, Jancis Robinson, was raving about Gamay wines produced by Sorrenberg of Beechworth in north east Victoria, Australia – she mentioned that it might be “one of the most exciting Gamays I have ever tasted”. I like sequels, Well, in the movies – sometimes, not so much. But when it comes to the writing, whatever you forgot to say in the first part, you can say in the second, and feel good about it, claiming that this was the intent from the get go. What I didn’t mention in the first post about great tasting of Georges Duboeuf 2011 Beaujolais portfolio is that red Beaujolais make one of the best red wines for summer – they are typically light in alcohol (if you noticed, 13% ABV was the most for all wines mentioned in the first post), and they also taste the best when they are slightly chilled. Considering how hot this summer is across pretty much the whole US territory, I hope this will help you to find a good red wine for the hot day, because sometimes it just have to be red. In the first post, I described a self-guided part of tasting. That tasting was followed by the lunch, both of which (tasting and the lunch) taking place at db Bistro Modern, one of the restaurants of the famous chef Daniel Boulud. 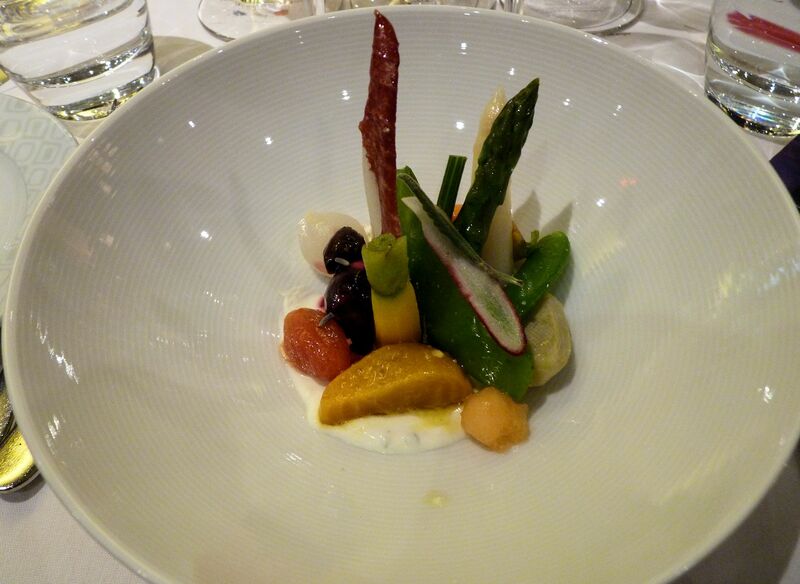 After Georges Duboeuf’s presentation, the first dish was served – “Legumes du Marche” – Young Garden Vegetables, Fromage Blanc Dressing, Lavender Honey Vinaigarette. This dish was paired with 2011 Georges Duboeuf Beaujolais-Villages, and it worked together very well by wine complementing soft and earthy flavors of the vegetables. 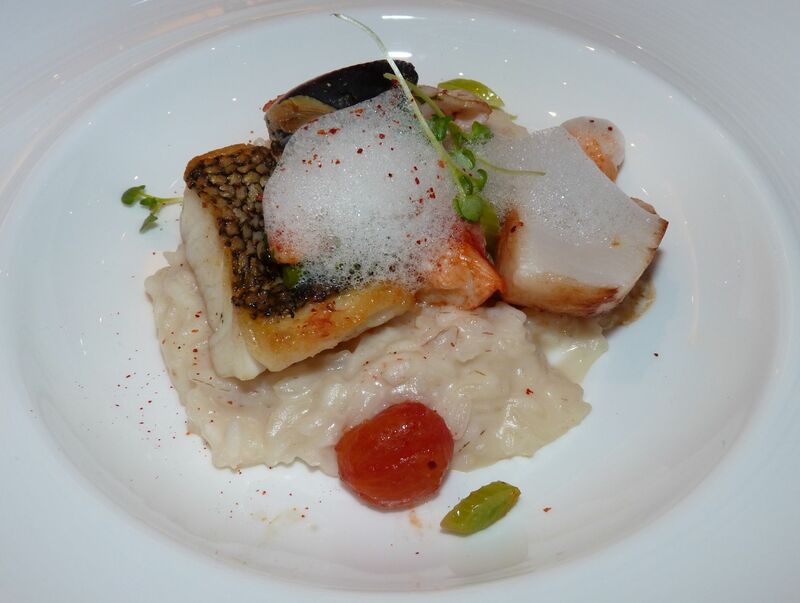 White wines were served with the next course, Seafood Risotto – Black Sea Bass, Scallops, Squids, Cockles, Fennel, Tomato Confit “Fumet” Emulsion. Pouilly-Fuisse worked perfectly well with risotto, which was a unique experience for me. Creaminess of risotto cancelled out some sharpness of the chardonnay, creating next level of experience. 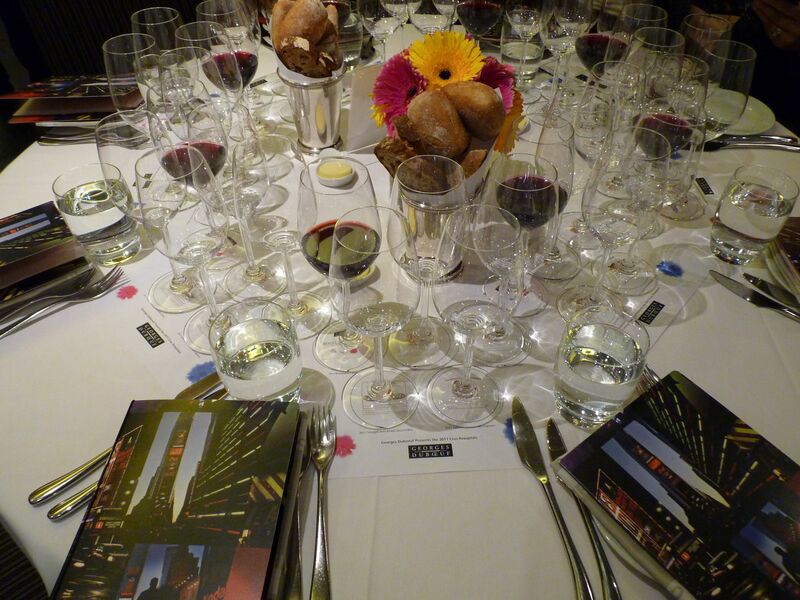 For the next course, Georges Duboeuf presented two red wines, Morgon and Julienas. He described Morgon as having “violet, cassis, kirsch on the nose, same flavors on the palate. A lot of structure. This wine will age very well”. Regarding Julienas, he said that “it is a very special wine, it has great personality. 2011 was a lot like 2009. This particular wine had the biggest success over the last 5-6 years. It was very critical to expand the vineyard (by 4 acres) for the success of this wine. This is a very noble wine with great aging potential. The wine was bottled a week before, right before the event”. 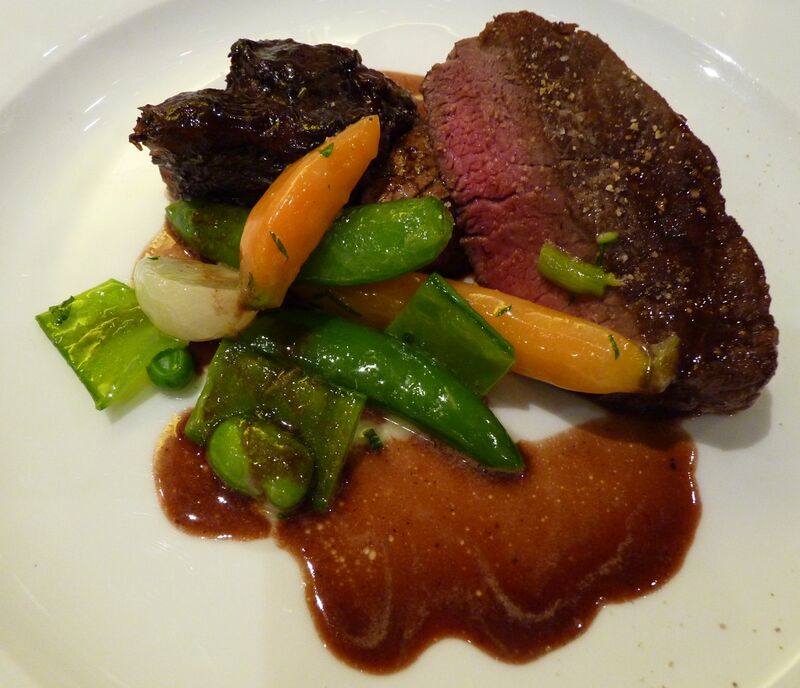 These two reds accompanied the last course of the meal – Duo of Beef – Braised Short Ribs, Beef Tenderloin, Spring Vegetables, Sauce Bordelaise. I have to tell that while both food and wine were delicious in its own right, they didn’t work together, so the pairing was not successful by not elevating the whole meal to the next level. But I also have to admit that both food and wine really didn’t bother each other too much – they were really two absolutely parallel experiences without a merge or a collision (which is often the case when wine and food don’t work together). 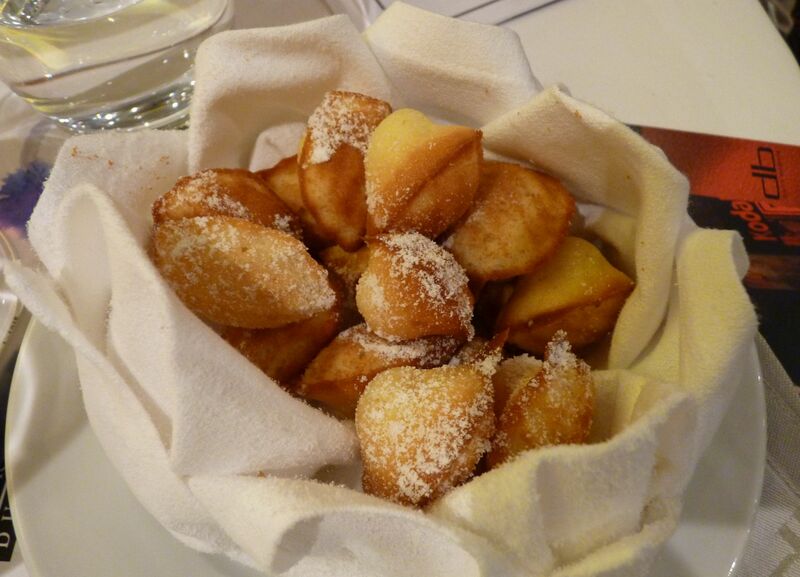 And then…there was a dessert, which was delicious and not paired with any wines (I also have no idea how this little cookies should be called, but it was very hard to stop eating them). All in all, it was one great event, both in the information and experience. Summer is still on, my friends – go find a bottle of Beaujolais to kick it off after a long day. And make an extra effort to find one of Georges Duboeuf wines – it will well worth it. Cheers! 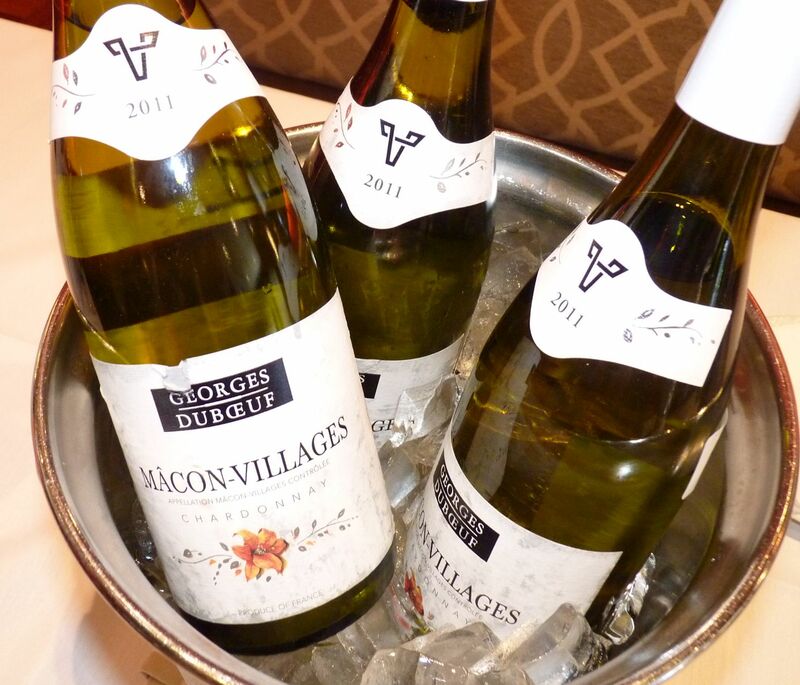 When you hear the word “Beaujolais”, what is the first thing which comes to mind? 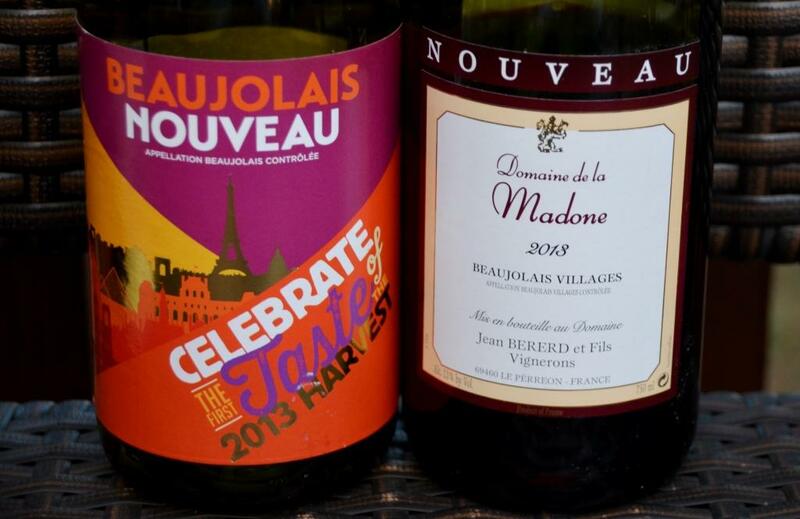 Beaujolais Noveau? Yes, me too. At the same time, Beaujolais is a large wine producing region, in area much bigger than Burgundy which it is technically considered to be a part of. And of course there is a lot more wine produced in the Beaujolais region than just a Beaujolais Noveau, a celebratory wine of a new vintage. At the beginning of June, I was lucky enough to be invited for the tasting of the 2011 portfolio of wines of Georges Deboeuf. 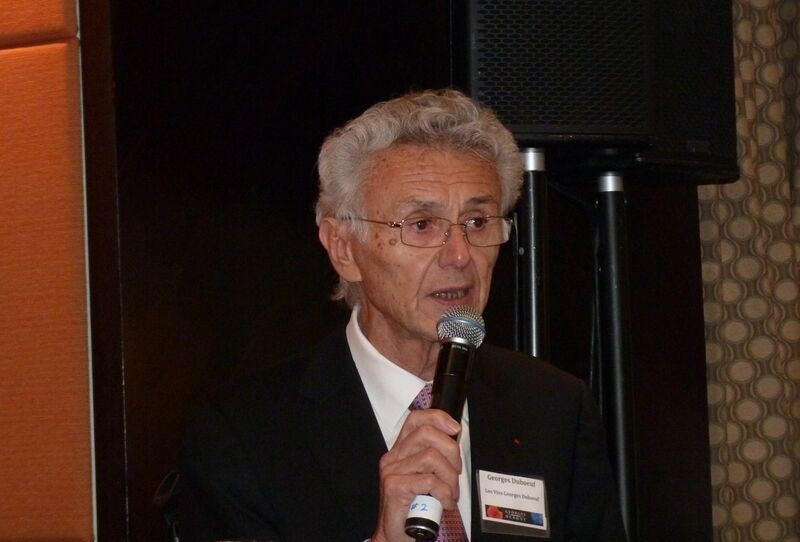 Georges Deboeuf is one of the largest and well-known wine merchants in France. He is credited with literally single-handily creating the Beaujolais Noveau phenomenon and often is called the “King of Beaujolais”. I also think that his success with Beaujolais Noveau, both wine and celebration of the new vintage with pleasant but very simple grapey wine, appearing in the stores all over the world always on the third Thursday in November, is also an enemy of serious Beaujolais wines, which can be absolutely fantastic – but this can be a subject for a whole different post, so let’s talk about the portfolio tasting of 2011 Georges Duboeuf Beaujolais wines. No, wait. Before we talk about the wines presented in the tasting, let’s take a quick look at Beaujolais wine region. Beaujolais region is located to the south of Burgundy. Red wines constitute absolute majority of wine production in Beaujolais, and Gamay is pretty much the only grape used in the production of that red wine (with small plantings of Pinot Noir been phased out little by little). White wines are produced from Chardonnay with Aligote been also allowed, but overall production of white wines is miniscule. Three levels of wines are produced in Beaujolais – Beaujolais, which allows usage of the grapes from the whole appellation – these wine should generally be avoided; Beaujolais-Villages, which are better quality wines, and so called Cru wines (top level). There are 10 Crus in Beaujolais – Brouilly, Côte de Brouilly, Chénas, Chiroubles, Fleurie, Juliénas, Morgon, Moulin-à-Vent, Régnié and Saint-Amour. In general, Beaujolais wines are considered simple and easy (and thus work well with wide variety of food), and also have lesser aging potential than, for instance, the wines of neighboring Burgundy (however aging is usually defined by the talent of winemaker more than anything else). Now that you know all the theory of the Beaujolais wines, let’s talk about tasting. 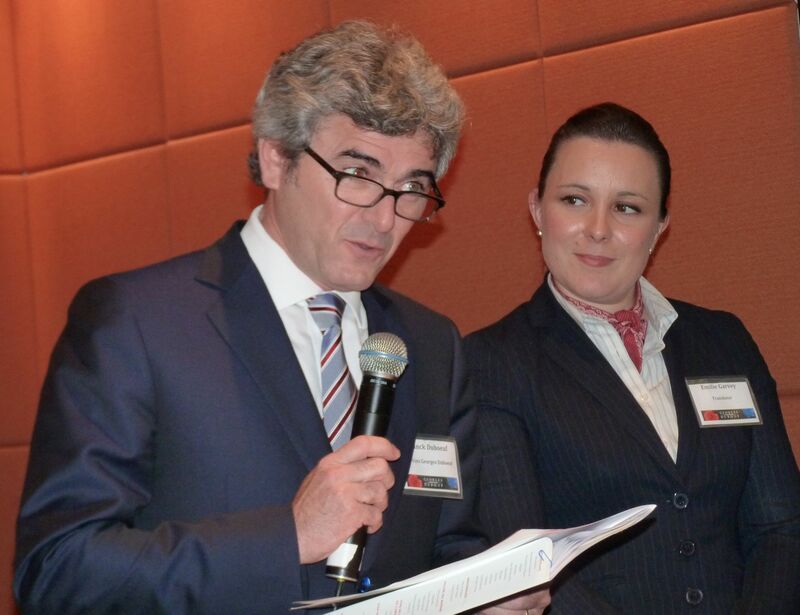 The tasting was organized by CRT/Tanaka and I would like to thank Caroline Helper (@ForgetBurgundy) for invitation. The tasting took place at DB Bistro Moderne in Manhattan, and it was split into two parts – self-guided tasting of 12 different newly released wines from Georges Duboeuf portfolio (some wines on the list were denoted as barrel samples, as they were just bottled a week before the event), following by organized lunch. Little bites of food were served during the self-guided tasting, and I had an opportunity to try a famous Daniel Burger (with foie gras inside!) – and it was absolutely delicious. 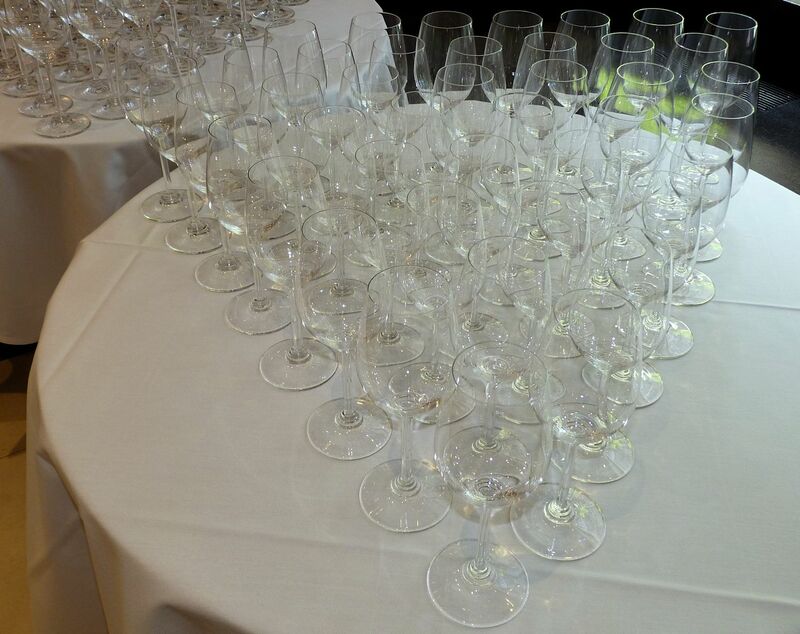 Here I will share with you my notes from the self-guided tasting – description of the lunch, where both Georges and Frank Duboeuf presented their wines, will make up a separate post (ahh, I hope it will not take me another month to write it!). Of course I can’t leave you with just notes, so you will also see some pictures. In the end of the day, all the wines were showing very well, and if you think about QPR, all the wines were great values. Make no mistake – some of these wines are in a very limited production (especially all the Domaine-denoted wines), so you will need to make an effort to find them. But – it worth the reward! That’s all for my first part of the report, folks. Until the next time – cheers!